Cloud sofa with curved back and walnut legs, American 1960s. Fabric has wear and tear due to age. Pricing includes reupholstering COM. Legs are in excellent condition. Original fabric is worn and needs to be replaced. Price includes reupholstering COM or COL. Elegant sofa daybed model no. 5334 with separated back and arm with walnut legs designed by Edward Wormley for Dunbar, American, 1953. Chic clean line sofa with solid Lucite legs, American 1970s. Elegant sofa with four back pillows and conical mahogany legs by Edward Wormley for Dunbar, American, 1950s. "Paradise Sofa" with birch legs by Kerstin Horlin-Holmquist for Nordiska Kompaniets, Sweden, 1960. Reupholstered in luxurious mohair. This is a beautiful sofa. Very comfortable midcentury sofa made with beechwood legs and newly upholstery. Italy, 1960s. 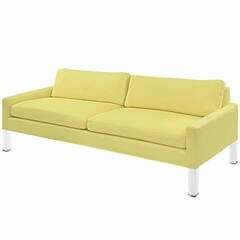 Kagan style "Cloud" sofa, features solid metal polished legs, new hand cut foam, recovered with great plains mohair. A comfortable tufted back settee with a single large seat cushion, original upholstery.